Unless you've spent the last few weeks under a rock, you've certainly heard of the "titans of Q1" this year, PS4 exclusive -"Horizon: Zero Dawn" and Nintendo exclusive - "The Legend of Zelda - Breath of the Wild". Both titles are amassing a ton of deep praise from various media outlets and for good reason, they're pretty incredible. I've been juggling both games at the same time, which has been incredibly challenging but ultimately rewarding (I currently have about 30 hours in each game). 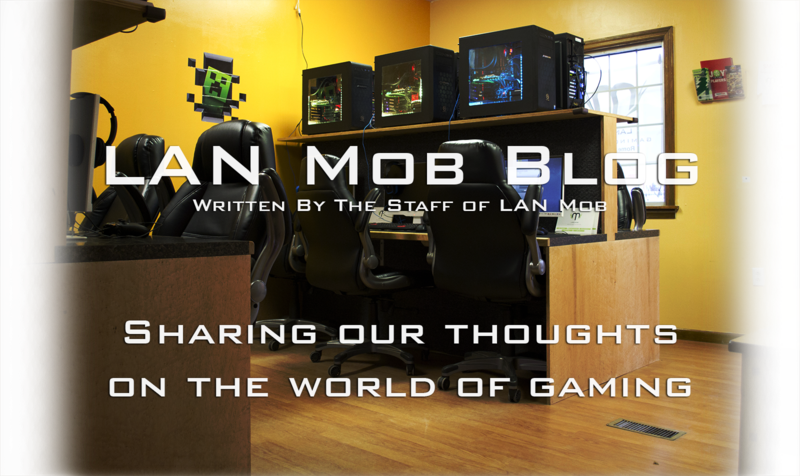 Luckily, I don't even own BOTW, so I'm being kept in check there, limiting my game time to whenever the Switch is available at LAN Mob/after hours. There's a lot of buzz for both games at the shop as well, and I've had to help multiple customers decide what game they should give their current attention to. 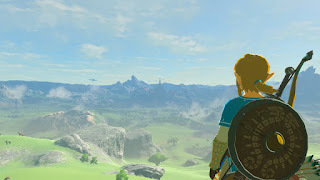 I quickly began comparing and contrasting both of these open world adventure games to help players make a well informed decision, comparing the same categories of gameplay, and I've gathered everything right here! Before we get started I'd like to note, both games are an absolute blast and honestly, if you are able to, you should play both. This just might help you decide what to play first! Oh and minor spoilers ahead! Horizon: Zero Dawn is quite possibly the most gorgeous game I've ever had the opportunity to play. Guerilla Games utilizes the technology platform "Decima" to create environments, creatures and human characters that are easy to confuse with real life. The rich detail saturates every facet of this PS4 exclusive and even a small bush on the horizon is as crisp as possible. Apparently it runs at an even higher level on the PS4 Pro, which blows my mind. Breath of the Wild takes a different graphical approach, utilizing "cel shading". There has been a lot of debate as to whether or not cel shading was appropriate for Breath of the Wild or if Nintendo should have used the realistic style present in Twilight Princess. It seems cel shading as a style is extremely polarizing, some people love the style, where some people frustratingly refer to it as "cartoons" and shun it immediately. However you may feel about cel shading, I can confidently say Breath of the Wild is the absolute pinnacle of what this art style has to offer. The visuals are so charming and breezy, and no sacrifices are made to make the world feel whole and filled with life. This may be the easy way out, but I genuinely do not believe one of these games has a graphical advantage over the other. Horizon's realism and wow factor is impressive, but Breath of the Wild really pushed the boundaries of cel shading. I truly believe this one is a matter of opinion, because both titles do what they do perfectly and both are an absolute treat to look at. If HZD used cel shading I truly believe I wouldn't like the game as much and vice versa. Horizon: Zero Dawn's combat is centralized on archery, and it does it extremely well. 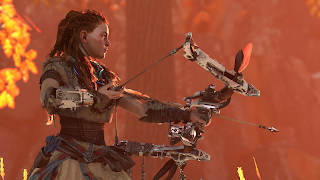 Aloy has multiple bows at her disposal that fire a plethora of arrow types including fire, piercing, lightning, ice, etc. The simple act of pulling back on your bow and sending an arrow flying feels incredible and natural. On top of archery, Aloy has access to a few other weapons including a sling shot that fires bombs, a bunch of different placeable traps and even a spear. She is also equipped with an old technology dubbed the "Focus" which helps her scan and identify weak spots on various creatures. Aloy can also take multiple approaches to each encounter, staying hidden and striking from the shadows, using the environment to your advantage or even taking a head-on approach. 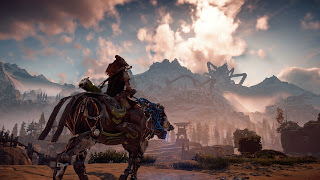 Horizon doesn't have traditional boss fights but there are definitely creatures that are essentially a boss encounter, and these fights are very well designed and prove to be a total blast. 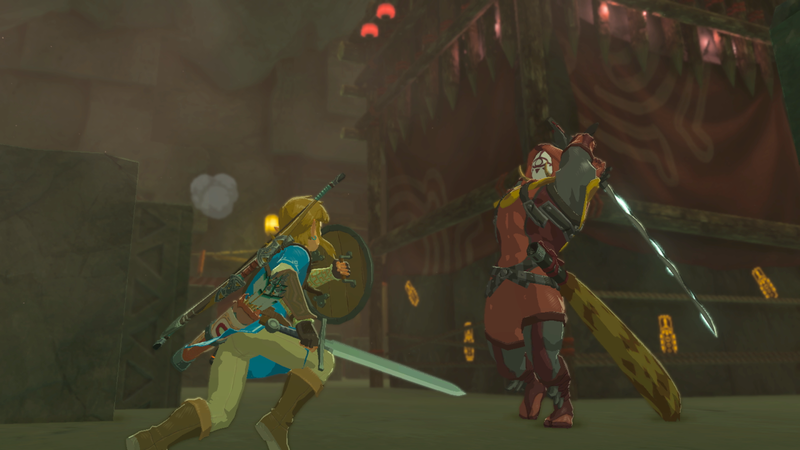 Breath of the Wild's approach to combat has much more variation. Players can pick up a huge variety of weapons from the environment, including swords, shields, bows, spears, axes, clubs, wands and the list goes on and on. These weapons will break over time, forcing players to always keep an eye out for their next defense against Ganon's forces. Players can also utilize powerful "Runes" that grant abilities like spawning bombs, magnetism and even time manipulation. Link is also capable of parrying enemy attacks, similar to Dark Souls, as well as unleashing a "Flurry Attack" as a reward for a perfect dodge. Every encounter can be dealt with in so many ways it makes my head spin, some being absolutely hilarious. Breath of the Wild's boss encounters are also fantastic, even if they can be a bit easy. Surprisingly, this was one of the easiest decisions to make. Horizon's combat is perfect for what it is, and Aloy's arsenal makes a ton of sense in the confines of her world. It's important to note that Horizon's archery outshines Breath of the Wild's in every way imaginable, but there's just so much more going on in Zelda. Even though the combat is relatively simple, the freedom, massive arsenal and huge bestiary just makes combat more enjoyable. Not to mention the incredible feeling of parrying a creature 10x your size, sneak attacks, flurry combinations and the intense satisfaction of pushing a giant rock down a hill to squish the Bokoblins below. Horizon: Zero Dawn's plot has kept me completely engaged for 30+ hours. Aloy's story is a compelling look at a post-post-apocalyptic world in which humanity has resorted to living in tribe-like communities. 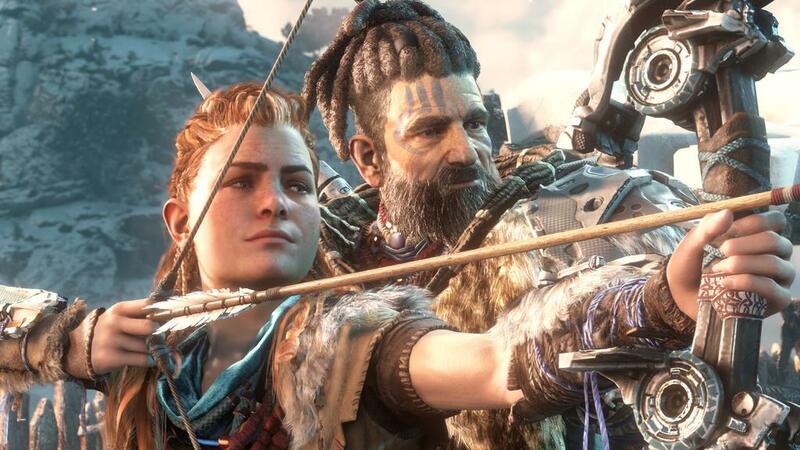 Living as an outcast for her entire youth, for reasons she does not understand, players follow Aloy as she uncovers the mysteries behind her own existence as well as the downfall of the human race. There are multiple moments in the plot that left me with my mouth wide open, and these moments are only enhanced by the incredible voice acting Guerilla Games brought to the table. Horizon tackles multiple extensive themes like racism, the impact of technology, reclamation, abandonment and authority. There is some weak and corny dialogue sprinkled about, but overall the character interactions are not only believable, but genuinely interesting. Players play as Link, awakening from a 100 year slumber with no memory to find that his beloved home of Hyrule has been overrun by Ganon and his evil forces. Players quickly learn of a prophecy detailing Link's duty as a knight of Hyrule to destroy Ganon once and for all, following his and Princess Zelda's failure to do so many years ago. Link sets off to free the 4 divine beasts and their champions (dear friends of Link that he has forgotten) to help combat Ganon and finally bring peace to the land. Breath of the Wild doesn't bring anything particularly surprising to the plot, but fans of the series will feel right at home and newcomers certainly won't feel like this style of storytelling is taking away from the experience at all. Players have the ability to earn some of Link's memories back by visiting specific locations or simply via the main story and these flashback moments make up some of the strongest narrative bits the game has to offer. You may have heard some of the voice acting during these emotional moments is sub-par, and I would have to agree. Despite the authentic charm present in Breath of the Wild's narrative, Horizon Zero Dawn just has much more meat on its bones. I found myself extremely engrossed in the world of Horizon, telling myself "one more hour" not necessarily to topple another mechanic behemoth, but sometimes just to see what was going to happen next. I certainly believe Breath of the Wild is tackling some heavy themes of degradation and destiny, however Horizon is digging a little deeper to really entice players with a master crafted plot. I was struggling a bit with some game mechanics present in both titles and how to compare and contrast them, and ultimately decided on naming a category "environment" instead of "Things to Do" or something silly. This does not mean how pretty the game world looks, rather how players can interact with it. Horizon's world is pretty vast, with multiple biomes including a lush forest, snowy mountains, forsaken deserts and even taboo underground technological marvels. There's plenty to do in each area like collecting documents and relics of the old world, completing various "Hunting Grounds" to earn accolades, climbing up "Tallnecks" to unveil portions of the map, taking out bandit camps, hunting machines and wildlife and harvesting materials to create ammo or upgrade various carrying capacities. 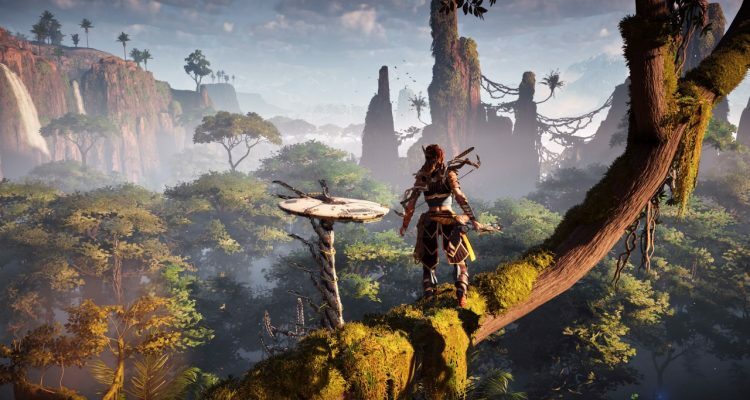 Aloy can get from point to point by running, sliding, sneaking, swimming and climbing very specific areas highlighted with yellow rocks and ropes. After a certain point in the main plot, Aloy becomes capable of "overriding" certain machines, using them as mounts. Players are also capable of fast traveling to areas they have been to previously, but they must craft a pack to do so. One of the most unique and memorable places of interest are called "Cauldrons" and have players solving some puzzles and combating some machines in very high tech and mysterious areas to unlock certain abilities. Breath of the Wild's world map is absolutely massive, so much so that when I first opened it up and zoomed out I believed I was looking at the whole thing. I was pretty impressed until LAN Mob regular MattBGames walked over and told me I could zoom out again, revealing even more of Hyrule. Hyrule is filled to the brim with any type of environment you can think of, from forest to deserts to snow covered peaks, swamps, canyons, castle ruins and on and on. However, these areas aren't just for ambiance, Link actually reacts to whatever environment he is in. Players must dress appropriately, or heat themselves up with a meal. That's right, meals! Players can collect a massive number of ingredients (30 hours in and I'm still finding new ones) and cook them together to create all sorts of stat boosting meals, which prove to be insanely useful. On top of collecting ingredients for food, the world is littered with treasure, spread out in nooks and crannies, enemy camps, and one of the many shrines in the world. There are 120 of these shrines to explore, and they're always a treat. Each shrine usually presents players with some sort of puzzle which upon completion gives progress towards a heart container or an increase to the stamina bar and a hidden treasure chest. On top of all these shrines, players are tasked with finding 900 Korok seeds, which can be uncovered in a variety of ways, and these are used to upgrade inventory space. With all these things to uncover, Breath of the Wild gives you a plethora of travel options to get to where you're headed. 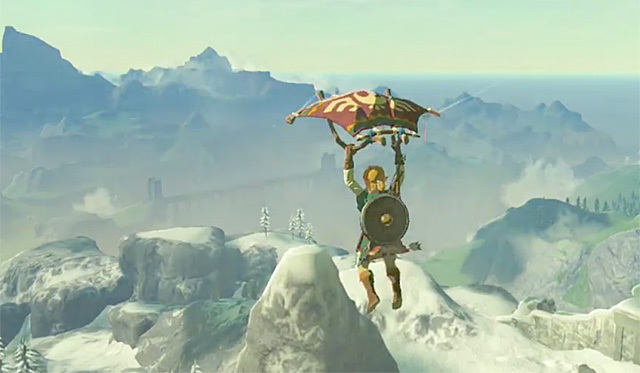 Not only can Link can run and swim as expected, he can also climb ANY surface, only limited by your stamina bar. Link also has access to a paraglider, sailing, shield surfing and various mounts (even Epona!) as well as a fast travel option to any shrine he's been to previously. If you couldn't tell simply by paragraph length, Breath of the Wild brings a lot more to the table here. Not only do the environments have a direct effect on gameplay via Link's ability to withstand weather, but they are fully explorable. If you see it, you can probably get there! I find myself getting completely side tracked in Breath of the Wild almost constantly, but due to the nature of the game I'm always being rewarded for it instead of being let down by finding nothing. I do think Horizon's fast travel mechanic is way cooler, forcing players to sacrifice some resources to hop around the map, but that dwarfs in comparison to Zelda's sheer ability to eat your time up. The game's soundtrack was composed by the same man who took on Guerilla Games' previous title Killzone, Joris de Man, working in tandem with The Flight and Niels van der Leest. The soundtrack features over 80 tracks and clocks in at over 4 hours long, and is available in full on Spotify. In an interview with Playstation's official blog, the team stated the OST's focus was centered around the three pillars of Horizon, nature, machines and tribes. There are some very interesting sounds at work to accomplish the goal the team set for themselves including, but not limited to, bowed dobros, guitars, fujaras, live strings, massive taiko drums and even circuit-bending synthesizers. Breath of the Wild's soundtrack was composed by Manaka Kataoka, who previously worked on The Legend of Zelda: Spirit Tracks, and newcomer Yasuaki Iwata. According to the soundtrack team, a lot of focus went into creating an ambient sound as opposed to a melodic one, written and based around the piano. There is an upcoming documentary chronicling the development of Breath of the Wild, and I'm ecstatic to learn more about the soundtrack. Winner - Breath of the Wild This one was extremely difficult because music is insanely subjective, more so than any other category in this post. The deciding factor for me was the simple fact that I find myself listening to the Breath of the Wild soundtrack outside of the game pretty consistently. I believe Horizon's soundtrack fits the game perfectly, but Zelda's OST is more timeless. 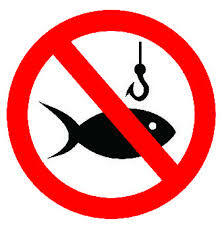 Neither game has proper fishing. Aloy and Link are capable of jumping into the water and catching fish with their hands, as well as utilizing archery or, in Link's case, bombs. There are some small features I didn't touch on, like Horizon's excellent photo mode, and customizable HUD, as well as Zelda's uncanny ability to set up game states and have NPCs comment on them. 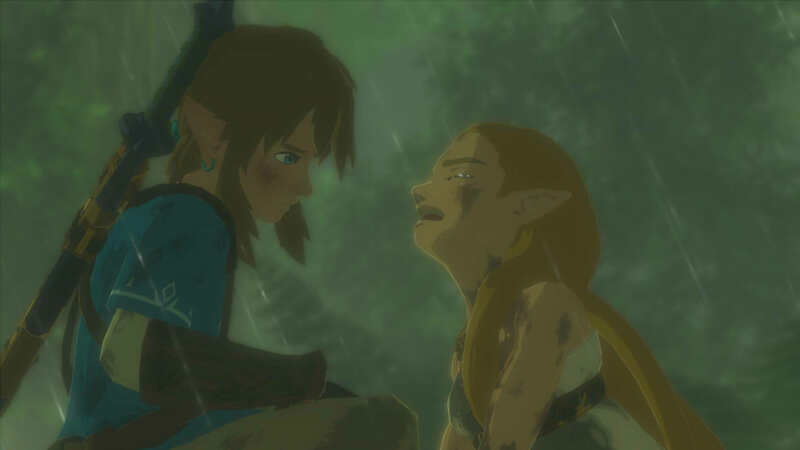 (for example, if Link is not wearing a shirt, NPCs will ask him if he is cold or if players complete a task before being told, NPCs will comment on his memory loss). As I tried to document above, each game has very potent strengths, like Aloy's intriguing dialogue in a mysterious world, or the goofy and unique characters in Hyrule, and some of these strengths may be subjective. It's important to note, that despite the very loyal fan-base the Legend of Zelda series has amassed so far, Horizon has managed to outsell the latest entry in Nintendo's mainstay and that's incredibly impressive for a brand new IP. However, at the end of the day, I feel no shame in saying Breath of the Wild's charm has me under its spell. I think Horizon has changed the game and upped the bar for open world games in general, but Breath of the Wild brings something to the table that's very hard to measure. I'm sure there are plenty of people out there who love Horizon more, which is awesome, and I'd love to hear their own perspectives! It's funny how March 2017 already has two very real competitors for Game of the Year. It's going to be a great year for gaming!